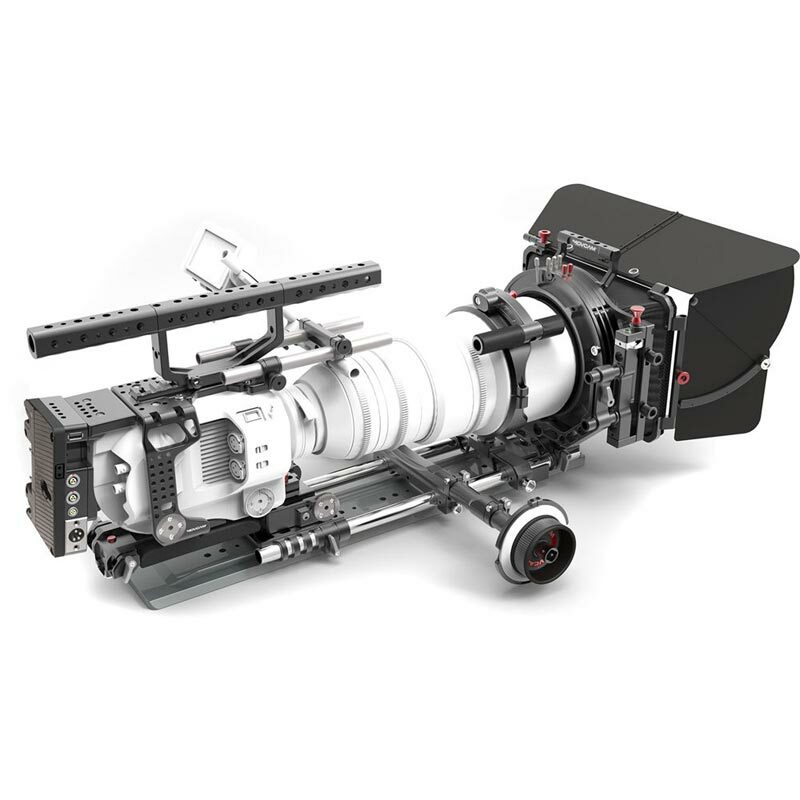 The FS7 19mm Cine Kit is a custom cinema camera rig for the Sony FS7 camera, complete with a dual-sided follow focus and 3-stage 5.65 x 5.65" matte box. It features a riser plate tailored to fit the bottom of the camera that docks into V-lock interface for quick-release attachment to VCT tripod plates, the baseplate adds front and rear 15mm rod clamps, a pair of ARRI standard rosettes, and an integrated shoulder pad. It can also be mounted onto an included 19mm rod bridge plate, which in turn can be mounted onto a 24" sliding dovetail plate. Also included in the kit is a form-fitting side bracket that adds 1/4"-20 threaded accessory mounting holes on the top and right side of the camera, and a rosette spacer. For the top of the camera, a 15mm rod mount is providing along with an adapter with a parallel rod port for attaching and re-positioning the camera's EVF monitor. A top plate screws into the top of the camera and provides a NATO rail for attaching an included long top handle, which adds additional 1/4"-20 threaded holes. Attaching to the rear of the camera is a V-lock battery plate and power distributor fits into the same slot as used by Sony's own V-mount battery pack. The pack provides a mean to power your camera using a V-mount battery and provides several power outputs in varying voltages for powering optional accessories. Two 8"-long 15mm rods are included for use with the top rod clamps, while a pair of 18" long 19mm rods are provided for the bridge plate. The 19mm rods support an included lens support, dual-sided studio follow focus with 0.8 pitch gear drive , and 3-stage swing-away matte box that features one fixed 5.6 x 5.65" filter tray and two rotating 5 .65 x 5.65" filter trays. 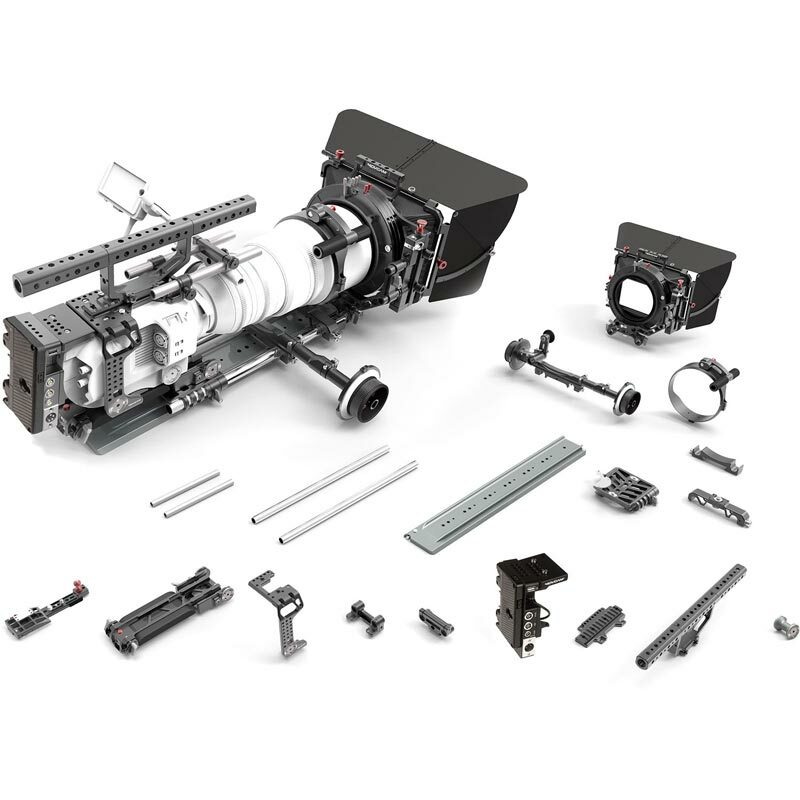 Additional kit components include a 19mm rod support for the bridge plate and a lens carry handle for an ARRI Alura 45-250mm lens.